Generic employment is the kind of job which describes the expectations and responsibilities associated with the job and do not concern with the procedure of doing it. This type of employment focuses on results rather than the process. Generic employment applications are written to get a job wherein you provide your complete personal information and answer some job-related questions to get the job. 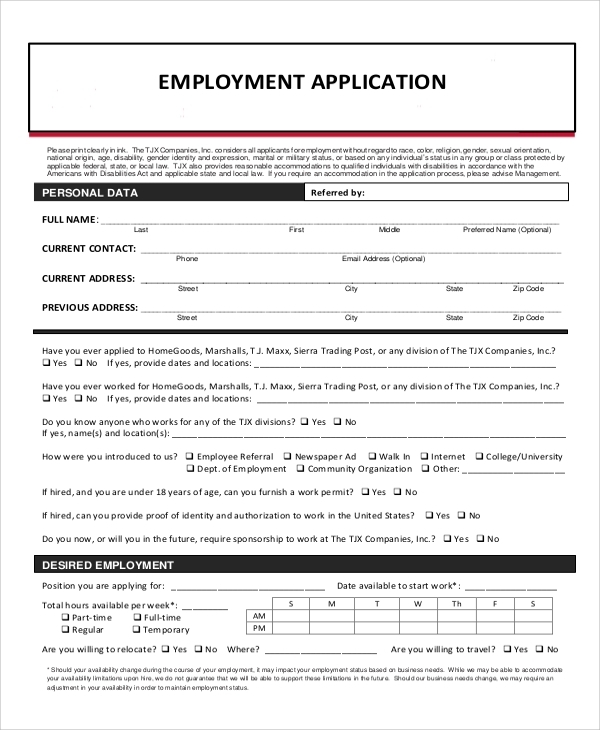 Some Sample Employment Applications are mentioned below for reference. 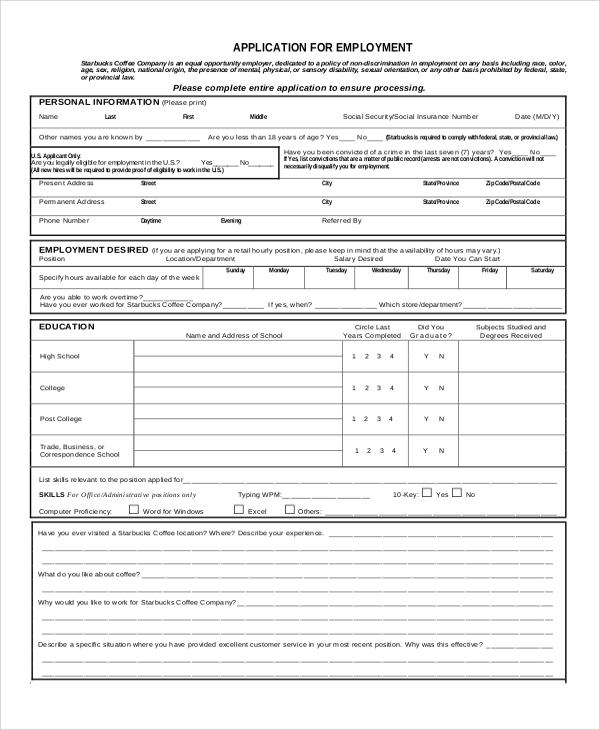 This Generic Employment Application Forms is concerned with a job in the legal sector or a court. The application is divided into several sections which record the applicant’s personal information, work preference, educational qualifications, work history, eligibility for the job, and other similar records. 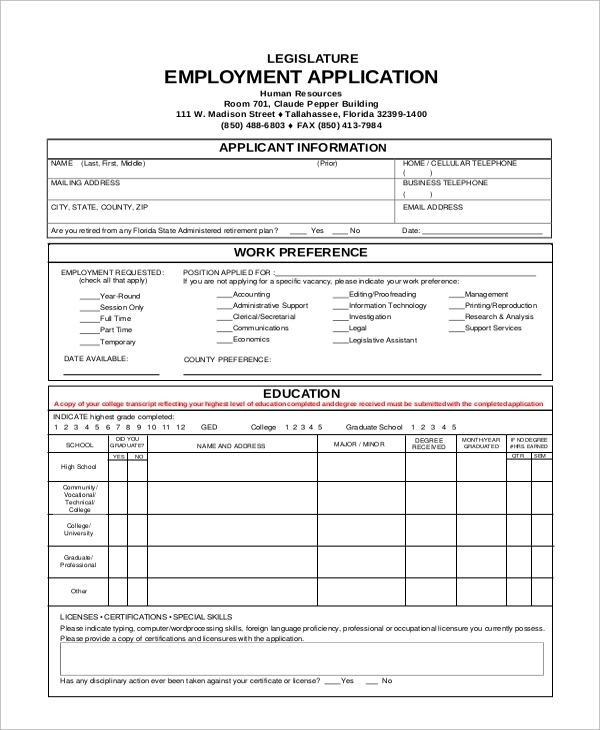 Sample job application forms for a restaurant job include the details about the candidate’s proficiency in English and record the work details. This application also consists of the terms that ensure the qualification of the applicant for the job. 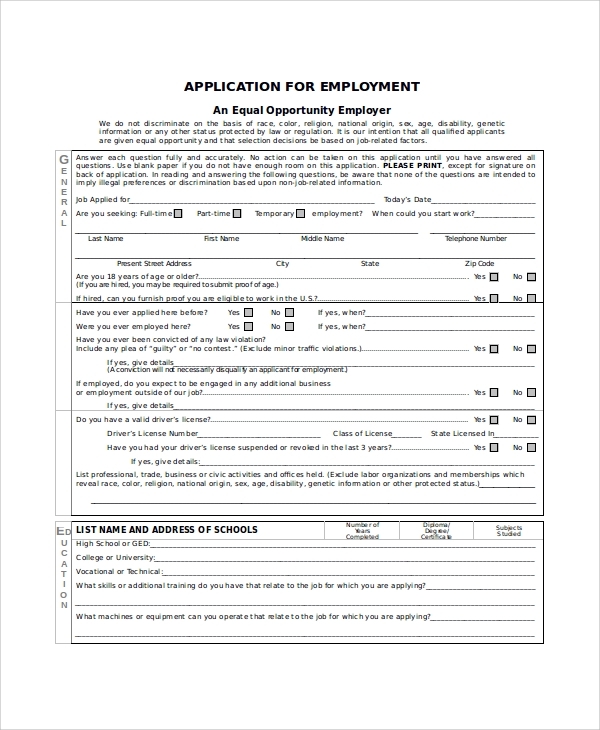 A generic employment application of this sort consists of several segments which include details related to the applicant’s personal information, education, and employment history. This application also contains a paragraph for the company’s terms to which the candidate agrees. What are the uses of these applications? Generic employment is wherein the procedure and tasks involved in doing the job are not taken into consideration, only the results matter. Generic Employment Applications require the complete information of the candidate to test his/ her eligibility for the job. It is useful for the candidate to convey the skills and expertise in the field by mentioning the previous experience and support it with educational qualifications. It is also helpful for the employer to pick out the suited candidates from the crowd. The employers utilize these applications to choose the right ones and train them in accordance to their weaknesses in their applications. 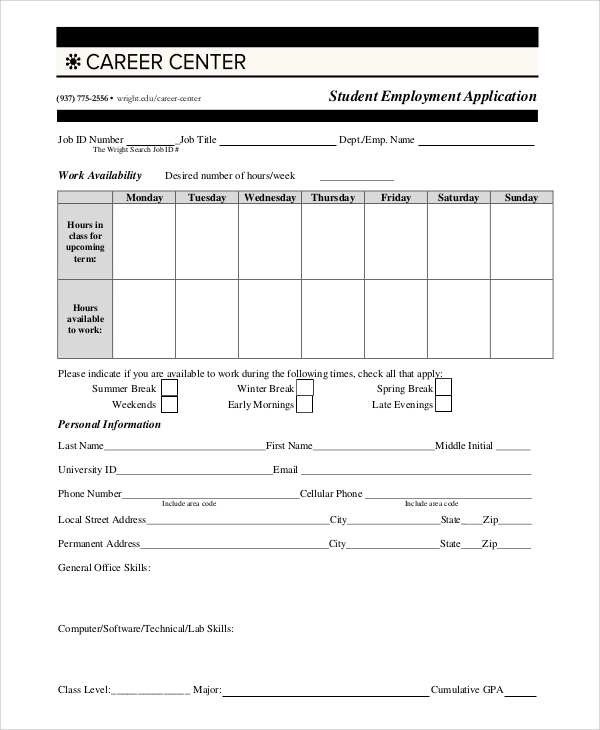 For students, the Sample Job Application Forms differ from the others. The candidate has to fill in the availability hours as per the requirement, educational qualifications, work and volunteering history, and personal details. 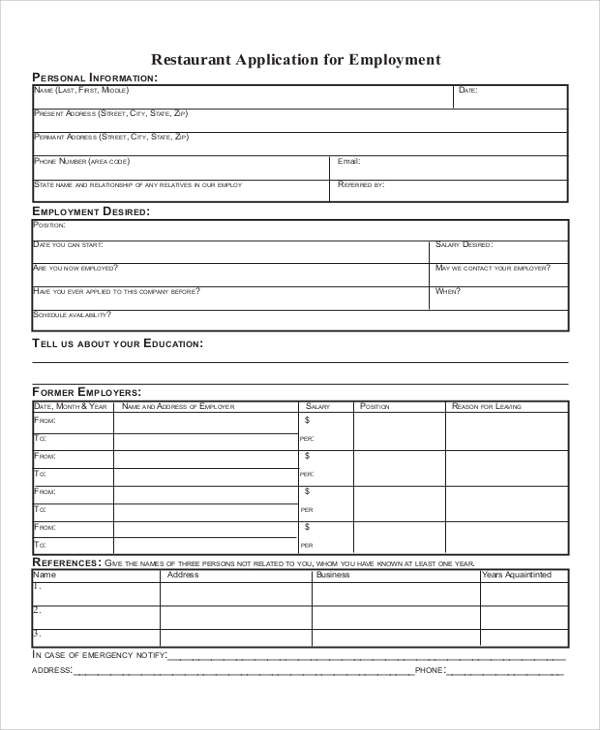 An employment application for a generic job records the applicant’s personal details along with the educational and career history. It contains the company’s terms and disclaimer to which the candidate is obliged to agree if he/she signs the application. What are the Benefits of these Applications? 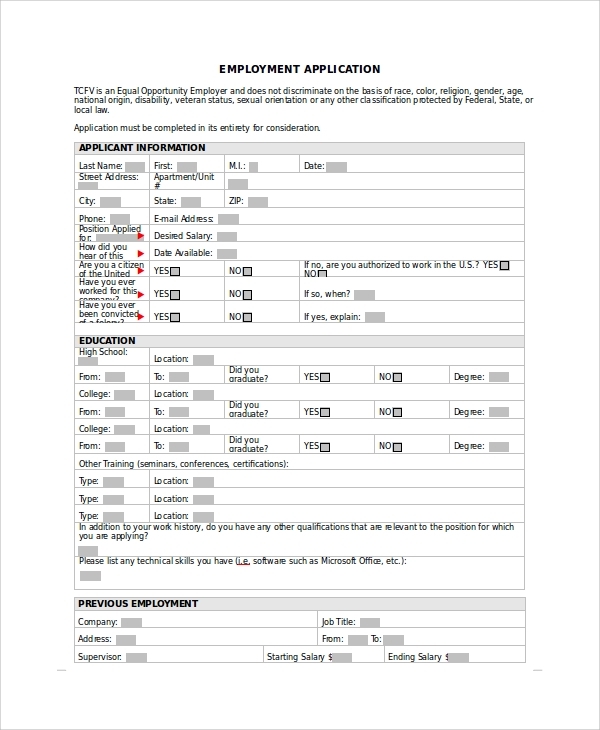 Sample Job Application Forms for generic employment have different benefits for different sets of people since these applications are available for various categories of jobs. For students, these applications are beneficial in fetching them a paid job. For the ones interested in law, generic employment applications are helpful for them in getting a job in their field of interest. The case works similarly for several other areas like entrepreneurial businesses, restaurant, schools, medical institutes, etc. The applicants mention their educational and career details for acquiring a job and gradually develop on their resume/CV. These applications also benefit the employer to choose the right ones and train them according to their weaknesses. 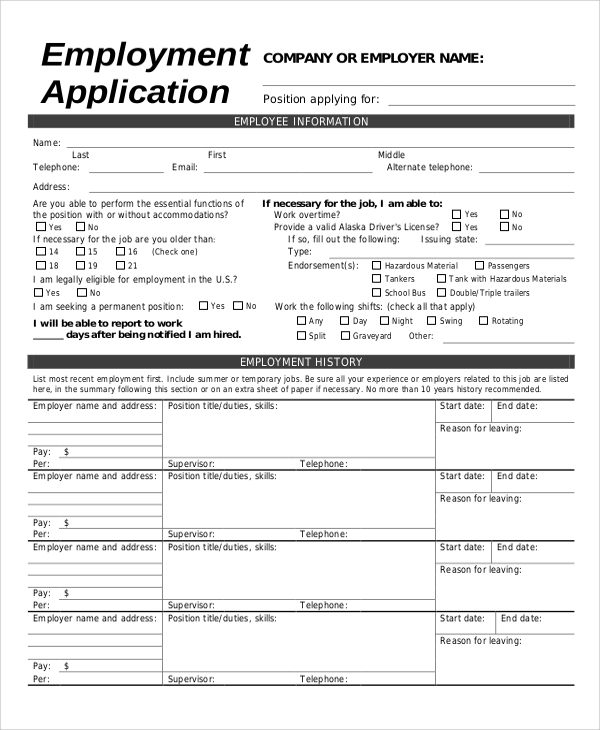 If you are looking for a generic job, look through Sample Job Application Forms for filling the applications correctly. These are constructive in the process of acquiring a job and help you to develop on your resume/CV. Generic employment applications are concerned with the whole background of the candidate including education, work history, job eligibility, and several similar sections.